When people look into traveling to Puglia, they are usually seeking beautiful seaside areas. t’s perhaps the most traditionally Mediterranean region in Italy, with little white towns, long stretches of coastline, and a relaxed atmosphere that gives you the feeling it’s been largely undisturbed for generations. However, much like the rest of Italy, the area is also home to some incredible statues and monuments that speak to the history of Italy. 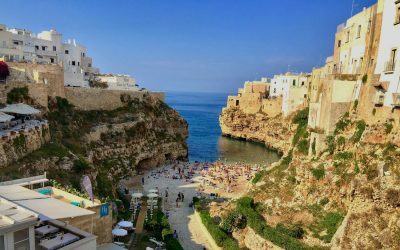 Below are a few of the things in these categories you might want to put on your sightseeing list in Puglia. The Colossus of Barletta is undoubtedly the most impressive statue you’ll find in the entire region of Puglia. It’s a towering figure, 4.5 meters high and rendered in beautiful detail that has stood the test of time. 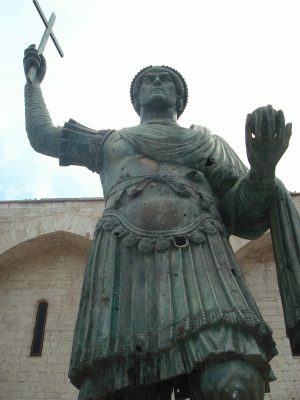 The figure depicted is stern and imposing, outfitted in what would appear to be Roman Imperial garb and holding aloft a cross. The Colossus has been a part of Barletta since at least the 13th century. What makes this such a fascinating statue, however, is that we really don’t know what it is or where it came from (or when – or even why, for that matter). We do know that it has stood in its present location at the Basilica of the Holy Sepulcher since 1491, as well as that it was probably made sometime between 300-400 A.D. The thinking is that it probably came from Constantinople, or perhaps the city of Ravenna, likely sometimes during the 13th century. Meanwhile, there are numerous possibilities as to which emperor it actually represents. We may never know all the details. But for now, the locals call him Are – a version of Heraclius, a Byzantine Emperor and one of the possible subjects of the sculpture. This is an ancient arch in the town of Andria, and is also known as the Porta Sant’Andrea, or the Saint Andrea Gate. Thought to have been built in the 11th century, it’s an incredibly stout structure, giving the appearance of a strong city wall in addition to an arch. The name “Arch of Frederic II” comes from the fact that the Holy Roman Emperor Frederic II famously passed through the arch as the people of Andria swore allegiance to him during the crusades. It’s almost a little bit hard to think of the ancient Roman gods in serious terms in the 21st century. That’s no insult to them or the people who worshipped them once upon a time. Rather it’s just a result of their having been highly fictionalized. Numerous action films, from Troy to Immortals, have either talked about them or depicted them for us. Many of us got used to almost comic book-style versions of them growing up. Video games too have given us wild, fantasy versions of them, and not just in major console offerings. “Age Of The Gods,” the first in a series of slot games based on the ancient Greco-Roman gods, is one of the most popular games in its genre. It too adopts the almost comic book-like imagery. The ancient town of Castro in Puglia, however, offers a nice reminder that these gods were once taken very seriously, and indeed were considered to be as real as more “modern” deities are to billions of people around the world. In this town are the ruins of a temple to Minerva/Athena, and a small statue of the goddess, known as Atena Frigia. It’s humbling to see even the crumbled ruins in person. This is a less historic statue in that it doesn’t date back thousands or even hundreds of years. But it’s probably the most noticeable statue in the region aside from the Colossus of Barletta, so it bears mentioning. 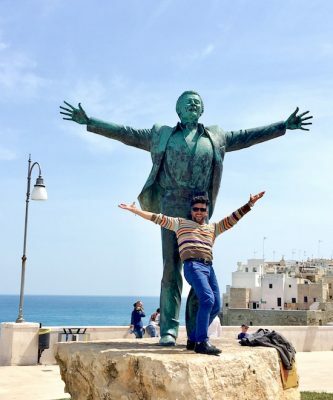 The Statue of Domenico Modugno honors the singer of the same name, who was born in Polignano a Mare and became a star in Italy. It’s a wonderfully expressive statue, appearing from certain angles almost to be in motion. This is a different sort of monument, but one that’s all the more interesting to see in person if you read up on its history a little bit. At a glance it’s a fairly ordinary old clock tower in the town of Minervino Murge, a beautiful town on the edge of the Murgia Barese mountains. The history, however, reveals it to be more than a decorative or practical structure. Apparently it was erected as an observatory to defend the town in the 15th century. It was commissioned by the feudal lords of the area before ultimately being converted into a bell tower – which was restored relatively recently. When you look closely, it’s actually quite something, and a nice final monument to include on your tour of the area.